Sam Burgess leaves Bath Rugby with immediate effect and returns to rugby league club South Sydney Rabbitohs, departing with two years left on a lucrative contract. In total he played 21 games for Bath and made 5 appearances for England, including the Rugby World Cup 2015. His skillset was and still is beyond doubt. However, the complexities of rugby union take a while to get used to. Many international players have been learning the game since a young age but it is not impossible to cross the codes, for example Sonny Bill Williams, Brad Thorn, Israel Folau and Jason Robinson. However, there are equally historic warnings. Henry Paul, Lesley Vainikolo and even England defence coach Andy Farrell didn’t make it when given the red rose jersey. Most startling of all is the story of Iestyn Harris. The fanfare over his arrival was heightened when he scored a hat-trick of tries and a total of 31 points in Heineken Cup win against Glasgow. He started at the pivotal number 10 position for Wales against Argentina and had an unsurprising difficult match with the Pumas getting the win thanks to the experienced Felipe Contemponi. Iestyn was a player rushed into international honours and history has been repeated with Sam Burgess. As a result the finger of blame for this debacle has to be pointed at the RFU power brokers and England officials who made the move happen and the muddled way in which he was handled once he was here. Stuart Lancaster clearly saw him as an inside centre but Mike Ford as Bath head coach who worked with him on a daily basis positioned him at blindside flanker, where he played for the first 5 months of 2015. Either way he needed more time in one position and it was unfair that he was vilified for his predictable naivety against Wales in the World Cup by the media and ex-player commentators. As a confident sportsman, a leader and a physical presence he would not have doubted his abilities to do the job but his selection was a decision made by supposedly more knowledgeable coaches who clearly got it wrong. It is an embarrassing scenario and the only way in which to appease the people is for Lancaster and his team to go. Imagine being Luther Burrell, Kyle Eastmond or Billy Twelvetrees. They have been spat in the face, publicly ridiculed and painted as not good enough to play 12 for England so instead they needed to bring in a rugby league player for 12 months. Those players and every other English rugby union player, who has dedicated their lives to excel in their sport, has been insulted and prevented from appearing at a World Cup tournament in their own country. The only way to regain the trust and morale of players is for the coaching team to go. Sam Burgess will now be tarnished as the rugby league player who couldn’t make it in union and quit when the going got tough. However, he can hold his head up high because he did everything asked of him and was let down by the people who should have known better. The score line is only a fraction of the story. Wales had been written off by many people after Jonathan Davies, Rhys Webb and Leigh Halfpenny, all key men in Gatland’s team, were ruled out through injury for the whole tournament. This was because they had been drawn in the ‘pool of death’ alongside Rugby Championship winners Australia and the hosts England who have luxury of playing all the big games at their Twickenham home. Last night’s game was the biggest clash between England and Wales ever witnessed because the reality is that one of the teams may not progress into the quarterfinals and the loser will almost certainly have to beat Australia and cross their fingers. As a result the hype and press coverage was on a scale very rarely enjoyed by rugby union, the team selections were debate excessively and the centre clash between Sam Burgess and Jamie Roberts was promoted as a physical contest which could shake the foundations of buildings in the surrounding areas of London. It was even a Royal occasion as William (with Kate) and Harry did battle in the stands over brotherly bragging rights. The game produced was a classic. Two evenly matched sides, countering the others offence with brutal defence and the scoreboard being kept ticking over by metronomic goal kicking. Mike Brown made himself look a right plum by getting involved with a confrontation, which was nothing to do with him in the first place, before being put in his place by British and Irish Lions captain of 2013 Sam Warburton. Wales once again had problems with the lineout and fell foul of refereeing interpretations at the scrum. A well finished try from England became the only difference between the sides as Wales stayed in touch on the scoreboard. Then Wales’ injury curse struck again. Scott Williams was stretchered off the field with a knee injury after being a threat in attack and solid in defence. Liam Williams took a nasty blow to the head and will now need to undergo all the concussion assessment protocols. Incredibly Hallam Amos also managed to pop out his shoulder attempting a hand off on Owen Farrell after the whistle had stopped play. So as a result Wales had a winger playing outside centre, a scrum half on the wing, an outside half deputising at fullback and the apocalyptically useless Cuthbert on the other wing. Despite these handicaps Wales produced a miraculous try with Lloyd Williams racing up the touchline and putting a delicate cross field kick inside for Gareth Davies to cement himself in the history books. That was only to draw level. The win came from a perfect penalty kick scored by Dan Biggar from as near as makes no odds the halfway line. 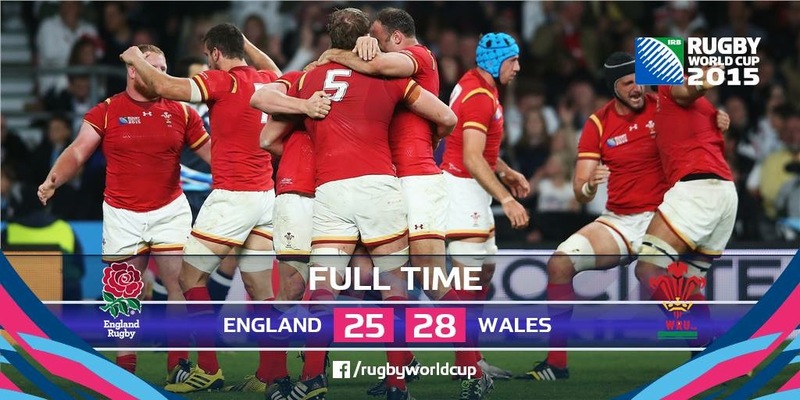 But to seal it Wales still had to defend that lead for their lives. England captain Chris Robshaw turned down the opportunity to tie the game under some illusion they could repeat the bravery of Japan against the Springboks. That was never likely to happen as the colossal Luke Charteris and colleagues dumped England’s driving maul over the touchline. Wales ran the clock down and who else but man of the match Dan Biggar booted the ball into the stands for the final whistle to cue delirium and ecstasy from Welsh fans across the world. In the public house I was in beer was thrown everywhere, supporters hit the ceiling they jumped so high in the air, grown men were in tears and people were left speechless by the spectacle they had just witnessed. However, this is far from being the end of the tournament. Wales now have to count the cost of their mounting injury list and finish the job on Thursday against a motivated Fiji where a try bonus point win could well see them seal their qualification for the next round. England on the other hand can prepare for a barrage of criticism debating the team selection and the captaincy of Chris Robshaw. Owen Farrell more than proved his worth but the selection of Sam Burgess will be questioned as he offered little other than in defence and even then his inexperience in the sport may have led to them conceding far more points. 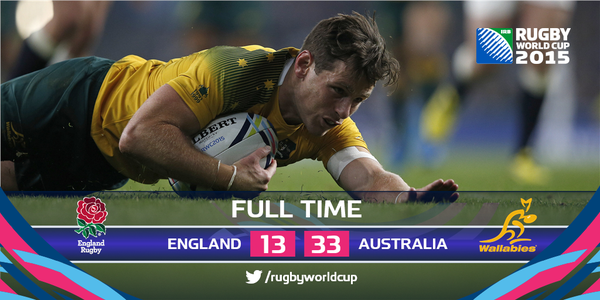 But now the match against Australia could not be bigger for England at their own tournament. As for Wales they have once again managed to pull off another smash and grab raid of fortress Twickenham and whatever happens in the rest of the Rugby World Cup that moment of victory last night will be talked about for years and years to come.